Gitbox is a pretty nice GUI to the Git version control system. All the features you’d expect are there: quickly see branches, history, working directory status, then easily commit, pull, merge, and push files with minimal effort. I first used Gitbox as a Preview version a while ago and enjoyed it, you’ll need both Xcode and Git installed to be able to run the app yourself. Check Out Everything. You may check out a local branch, tag and even a remote branch with a single dropdown button. From now on you don’t have to remember the obscure branch-tracking command or edit .git/config. Select the remote branch, type a local name for it and you’re done. Up To Date. Gitbox updates working directory status each time you focus the window. When in background, it periodically fetches data from the selected remote branch and displays unmerged commits in the history. The status of the working directory, local and remote branches are always up to date. Rich History. History shows all commits on both local and remote branches. Non-pushed commits are green. Non-pulled commits are grey. You can also select another local branch in a “Remote branch” menu to merge it into the current one. Clean Design. There are no palettes or additional windows cluttering the screen. Your repository fits nicely inside a single window with a few buttons. Use the Main Menu for infrequent operations such as adding a new repository URL or stashing away changes. Super Fast. We all love the command line for the speed. But it is not very smart. Say, you move a file from one folder to another: in the Terminal you would have to “git rm” the old path (the file is gone, so no tab-completion) and “git add” the new path. And it becomes a real pain when you happen to rename multiple files. But in Gitbox you just click the checkbox. Status is updated instantly, you don’t have to type “git status” ever again. 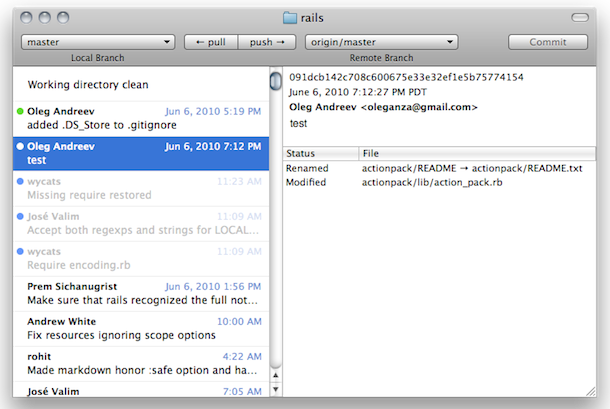 If you’re looking for a Git GUi client for Mac OS X, check out Gitbox.